For many years, I had a Sequel brand hat, a wonderful hat, made in the USA–actually, I owned two of the same model. The first one had a mesh body with a round foil patch on the crown to reflect the sun from my head, and a stiff solid bill lined with black, so the sun wouldn’t be reflected on my face. A cotton knit shawl or scarf attached with Velcro covered the back of my neck to keep the sun off when it was hot, and wrapped around the front when it was cold. When I wore that hat on a raft trip down the Grand Canyon, the red soil in the Colorado River turned it pink and it wouldn’t wash clean, but I wore that hat until the foil crumbled away and the Velcro stopped holding. Then I bought myself a new Sequel hat, startlingly white, with a rectangular foil patch and an adjustable chin strap, but with the same mesh body and soft scarf. I loved those hats! When the foil in the second hat began to peel away, I went shopping for the third one, but no luck! The manufacturer’s web site said he was closing up shop. He was going hiking! No more Sequel hats. I tried other hats, but none really worked. When I visited Machu Picchu, I saw a woman wearing a Sequel hat, and I tried to buy it from her, but she refused. What a disappointment. Then I saw a friend wearing a billed hat with a bandanna handkerchief pinned on with little safety pins all around the bottom. I thought, I could do that! I found a mesh hat. That was easy. It wasn’t made in the USA, it isn’t white, it’s tan, and it has a solid crown, no foil, but the bill is lined with black. Then I had to find a bandanna that would match it, and that wasn’t easy. I brought home lots of bandannas (I can always use another bandanna, that’s a topic for another post), and that became the project for my travels in the summer of 2009, to stop at every shop that carried bandannas to try to find one that was tan. Bandannas come in every color and eventually I found the right one. Then I had to try to attach it. I wanted to put Velcro on the hat and on the bandanna so I could separate or attach them easily. I asked my dear friend J.K. for advice before I cut the bandanna, and she took hat and bandanna away and came back a week later with the job done. 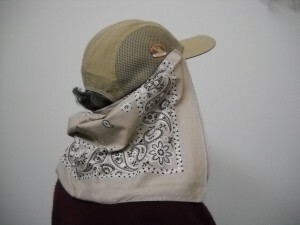 The bandanna is folded in half and has deep pleats that drape around my neck. I pinned a shoe string inside to use as a chin strap. My friend did a wonderful job. Now I have a fake Sequel hat, an adequate, but only adequate, copy of the original. I can’t say that it’s a pale copy, because it’s darker, but if ever I get to Durango, CO, I’m going to find that old factory, haunt the used clothing stores, and find myself another Sequel hat. This entry was posted in Camping and Hiking Equipment, Camping and Hiking Tips and tagged bandannas, Durango, Sequel hat. Bookmark the permalink. Let’s see a photo of the new fake Sequel hat on you, please! Ah, there it is. I may craft a version of that myself! Are you aware of anyone making hats similar to Sequels ? Maybe even a good condition used one? Mine has a wide brim all around it & the fantastic foil plus mesh. The brim is droopy so I need a new one. I would buy several if I could. I wish I did know of a similar hat. I’ve tried used clothing shops, even in Durango, but didn’t come up with any. That’s why I had my friend make the substitute hat in my post, but the bandanna scarf is really warm. Right now I’m hiking in a broad-brimmed hat from Duluth Trading Co. that has mesh on the top, but no foil. That foil was such a great idea! I found a brand new Sequel by Durango w/ the mesh sides & foil underneath inside middle @ a thrift shop & wear it all the time(I work outside all day). Went back to the same thrift shop and they don’y have anymore. I have been trying to find this hat again and no luck… if anyone knows where I can get a hat like this one please email me and let me know. I would buy “several” if I can just find them again!! Ok,still “in search of” the Sequel hat with the foil piece on top,anyone out there know where I can find one?? Still looking,no luck! I am looking for a pattern for rag of the Sequel hat. If you have a Sequel hat, would you consider tracing the rag onto a sheet of paper for me? Send me a snail mail address, and I will trace the “scarf” (I prefer that to “rag”) and send it to you. I’ve got a men’s m sequel hat if you want it, I’m selling it on my eBay page 🙂 they are impossible to find, your right, this one is new I just never used it like I thought I would. I have a Sequel hat for sale! email if interested. Rudy, Thank you for responding. I have a new post on the Sequel hat that I am working on today. Watch for it! Katie, thank you for responding. 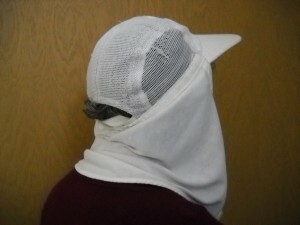 I have a new post on the Sequel hat that I am working on today. Watch for it. Thank you all for writing. Please see the latest on my new Sun Day Afternoon hat, posted April 2014. I have a white Sequel hat with foil in size medium. It does not have any tags but it appears to be unused. If interested please contact me. Looking for the a large sequel hat with the foil on the top for my husband. He’s had his for 20 years and I’ve been frantically looking on e-bay for years… he has that scottish skin and is in dire need of THAT DAMM DESERT RHAT HAT. Will pay! Please visit my blog, http://WWW.goldiesilverman.com, again and look for a post in April, 2014, about my newest hat, that I like even better than my dear old Sequel. Look for the hat, and let me know what you think of it. I actually jumped in a cold fast running river..risking my life to get my Sequel hat back..lol I am still wearing my hat after 25 years and its been all over the deserts of Arabia. Its tatty and worn out, but I still wear it. Testament to good American Quality Products long lost in todays clothing. I’ve had my Sequel Desert Rhat hat for nearly 30 years. Reading what people have written here, I am going to make another neck cape myself and devise a way to fasten it to the cap part. I am vey disappointed that the company closed, however, I understand the founder wanting to keep producing his great products here in the United States and that he could no longer compete price-wise with those that had moved manufacturing abroad is one of the reasons he closed his company. Virtually every other company I’m aware of has moved manufacturing overseas, and it has been my experience that quality control in many countries is questionable at best. Made in Canada is good, though I’ve not found anything as good as the Desert Rhat, regardless of country of manufacture. I have a new hat, SUNDAY AFTERNOONS, made of polyester, not cotton, very light weight and with good sun protection, but it was made in Vietnam.